The TaqPath 1-Step Multiplex Master Mix is a preformulated, universal, 4X concentration master mix designed to deliver sensitive and reproducible detection of up to four RNA (or DNA) targets in a single multiplex reaction. Two formulations of this multiplex assay-compatible master mix are available: TaqPath 1-Step Multiplex Master Mix with Mustang Purple; and TaqPath 1-Step Multiplex Master Mix (No ROX), which has no passive reference dye. Both mixes enable measurement of the JUN dye or a similar emission wavelength dye in the channel typically used to measure ROX dye. 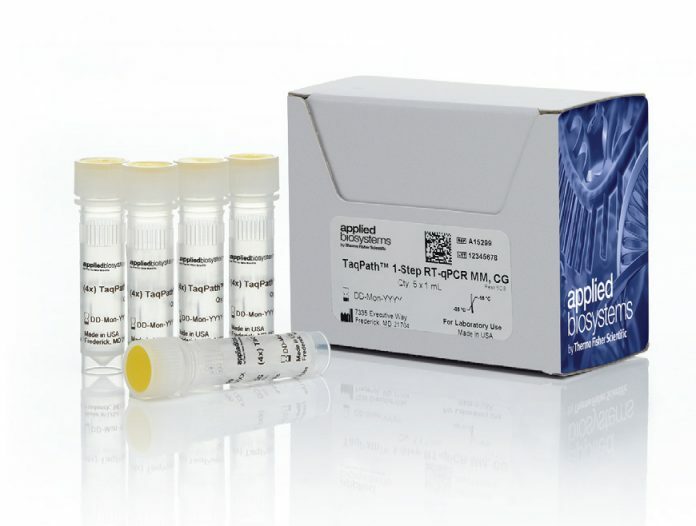 These two formulations join the line of TaqPath general purpose reagents—qPCR and RT-qPCR master mixes manufactured in an ISO 13485 certified facility to help ensure lot-to-lot consistency.